The leanings on this album are widespread (Neil Young, Yes, Beatles, King Crimson), and the changes are so fast as to be difficult to keep track of at times. If you like your prog fast moving and mercurial, this album is for you. 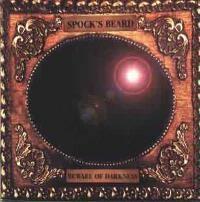 Spock`s Beard is Neal Morse, Alan Morse, Dave Meros, Ryo Okumoto and Nick D`Virgilio. Particularly the bass line and keyboard sound, but, in fact the whole song has a very old Yes sort of feel. A couple of the segments have a rather abrasive texture. Although the vocals are not Yesish, even the accompaniment feels like Yes circa 1972. For the most part, if that sound is what you are needing, this track will be your musical prescription. One of the latter segments of the song has a harder edge than the rest of the album. This cut feels a lot like Pentwater. However, since few have heard Pentwater, that description will tell little. Basically, the song is built on a dark and twisted mixture of ELP and UK, and includes a wonderful usage of vocal arranging. Thoughts also includes a Beatles influence and a instrumental section that has its foot firmly planted in UK roots. A beautiful piano intro (sort of Wakeman meets Joel) starts the piece. Eventually, the rest of the band join in and the piano drops down for the progish phase of the introduction. 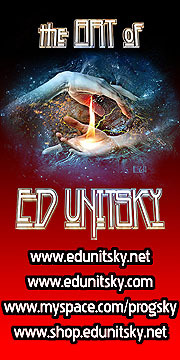 The central verse structures are strong and aggressive rock, but the chorus comes across as definite prog.The middle segment is based on acoustic guitar and voice, for the most part. This song has definite Yes leanings and features a competent reprise after the false ending of a door closing. Chatauqua is a well written and performed extended acoustic guitar solo. The composition has leanings both in folk and classical directions. Jumping right in with keys that are both Wakeman and Emerson tinged, this piece wastes no time getting going. Once the other instruments join the fray, they tend to bring along a Yesish feel. This intro is a textbook example of one of those sections that features so many rapid-fire changes, it is just a little difficult, but enjoyable, to try to keep up. The major influence on this song is Yes, but the cut is far from a clone of that style, and many of the verse sections are somewhat stripped down (less prog/more hard rock). This one starts with a feel a bit like Neil Young`s acoustic moments. The vocals are not Youngish, but the acoustic guitar really does have that sort of texture. Keys eventually join, and shortly afterward, the song kicks into gear. Set in a solid hard rock tradition, Waste Away is not quite metal, but a little distortion and attitude could get it there. Actually, the attitude is quite close at times. Starting very much like old Genesis, the entire intro is based on those types of textures. Although the verse sections are quite stripped down, the song shows signs of Discipline era King Crimson and the Beatles. The Crimson influences are more prevalent. Eventually, the progish textures take control of all sections of the song, and some fabulous vocal harmonies show up. This piece takes on many moods in a very quickly evolving.